Parius deliver us a quick-witted and zesty tech death experience, which is as entertaining as it is blistering. Really, what is there not to like? From the outset, with the vintage B-movie horror openings of “Into the Realm”, we already feel that there is a real treasure about to be discovered. And from here, we go into the first full length song “Eldritch”, a track with so much damn scope it should be a prescribed cure for metal-related boredom. 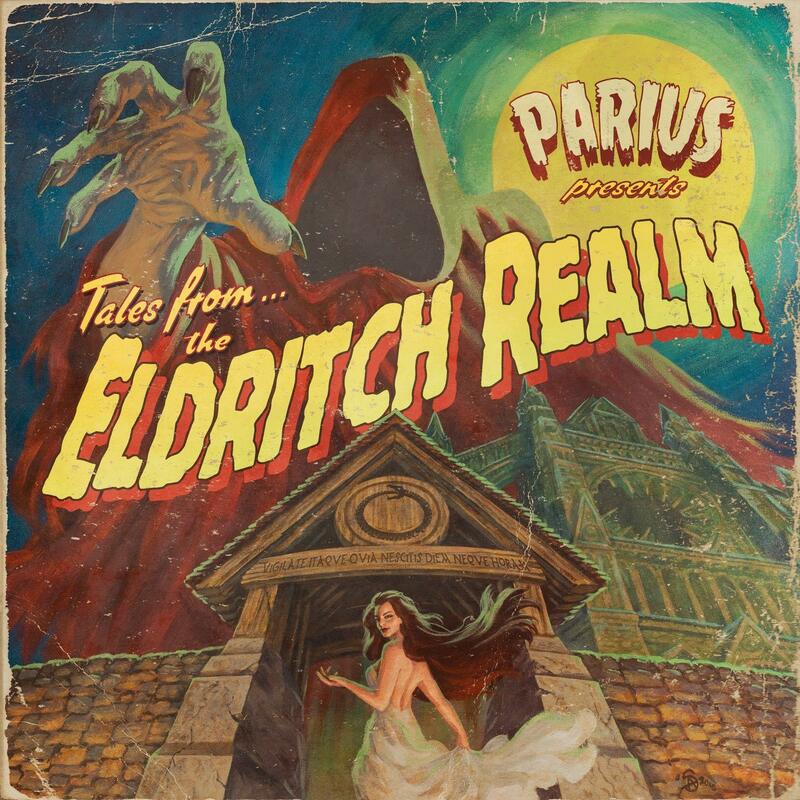 Within The Eldritch Realm, Parius deliver us death metal which goes, up down, front to back, and across every other inch of the fret board. They give us snippets of Between The Buried and Me, Lamb of God, and Beyond Creation but ultimately, they fall into an identity of their own. It’s that borderline tongue-in-cheek sense of adventure, adopted by many recent tech death bands of the past year, that makes me love this record so much. Parius are of the small contingency who have the talent of making the listener chuckle at the exact point they are supposed to. Yet at the same time, they do not stray too far from their staple intent of impressing listeners musically and simultaneously detonating eardrums. The pummeling groove of “Phylactery” is interwoven with some entertaining spoken-word vocals, reminiscent of Devin Townsend. Fourth track “The Binding” focusses on some of the traditional conventions of tech death, not that this will be a deterrent for anyone looking for a more experimental hit. At this point in the album, the majority of listeners will be hooked one way or another. And we get a pleasant change in momentum with “Between Hell and I”, a remarkable song primarily for the unrestrained vocal screams. But the technical musicianship comes to an explosive boiling point in “The Boundless”, an extremely apt name I find. The speed versus the density of each riff makes for a complex yet extremely pleasurable listen. Even the song’s soft proggy interlude is exploding with energy, so you can only imagine what the following solo sounds like. Those a cappella harmonized vocals at the end also make for a nice finish. But the biggest morsel of fun is saved until last in the album’s finale “Crashing Black Moon”. The track is a pacy concoction of jazzy licks and ultra groovy riffs which give us every bit our money’s worth. At eight minutes, it’s the epic finale that the album deserves, and the ultimate showcase of the band’s talent. Plus, I can’t stop laughing at that “Ooooohhh!” from the vocalist. It’s extremely crisp. It might also be worth mentioning at this point that the album in its entirety is pretty short, but it’s so well structured that you’ll feel well-fed nonetheless. One must also consider that the rapidity of ideas is so swift that they could fit amply in an album twice the length. But Parius’ choice of rich controlled bombardments of quality instinctively feels like the right one. Tech death might have been at risk of turning into a repetitive swill of unoriginal ideas, if it weren’t for bands like Parius. They do an excellent job of ensuring that outlandish liveliness plays its part and makes the genre a fun thing to dive into. Yet there is no compromise in the intensity, or technicality. So it’s all good. The Eldritch Realm is a well-measured burst of rocket-fueled madness that one will find near-impossible not to love. Previous PostForming the Void - "Rift"